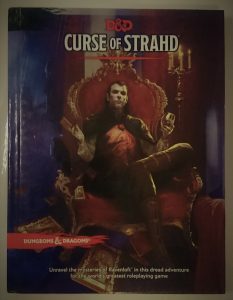 I’m running a Curse of Strahd campaign for six friends, playing Dungeons and Dragons 5th edition. The party consists of a human cleric, a half-elf paladin, a human barbarian, a tiefling warlock, a gnome rogue, and a gnome wizard. The following is a record of their first four or five sessions. Warning: Contains potential spoilers for people who are playing this campaign. A few short weeks ago, you set out to deal with some ‘beast men’ in the Trolldark Forest, having been dispatched there by your benefactor, Lady Morwen of Daggerford. After battling goblins, a giant spider, and the party of gnolls that had been harassing the local farmers, you decided to make camp for the night before returning to report your success in Daggerford. As you huddled around the fire on the unusually quiet night, a low mist gathered around the edges of your camp, moving closer as the night wore on. Suspecting danger, your party decided to camp in the trees, only to awaken to find yourself under foreign skies. All that remained from the night before was the fog, which left you no path except a muddy roadway through the unfamiliar forest. After following this road for some time, you emerged from the fog-shrouded forest to see an enormous iron gate, flanked between what would once have been magnificent statues of armed guardians, carved into the high stone buttresses. But now the statues’ heads lie among the weeds at their feet. Upon your approach, the rusted gate swung open, its hinges screeching painfully. Once you stepped through the gates, they slammed shut behind you. Now you found yourselves in a large valley, evergreen trees climbing the sides of the mountains all around you and rolling thunderclouds casting a grey pall over the land. Walking further up the road, the cleric caught the scent of death on the air. This led you to a human corpse half-buried in the underbrush some way from the road: A young commoner, muddy clothes torn and raked with claw marks, clutching a letter with a large wax seal. The letter itself was a warning from Kolkyan Indirovich, the burgomaster of Barovia, that the devil Strahd had bitten his daughter, Ireena Kolyana, and that he wished all visitors to turn back and stop anyone else from entering Barovia. The fog led you inexorably through the Village of Barovia to a dilapidated house with two small children waiting at the front door. The odd girl and boy introduced themselves as Rose and Thorn and told you about a monster in their house, refusing to go inside til it was gone. Despite some misgivings, you agreed to help them by killing the monster. As you explored the house, you gradually uncovered the truth hidden between its walls – that this was once home to a cult, who attempted to curry favour with Strahd but who were slain by him instead. You also find the real Rose and Thorn, both ghosts, who died inside the house after their parents locked them in their room and forgot about them. Asvoh discovered a talking skull in one of the rooms. (Who knows where that skull is now?) You also experienced strange visions, or hallucinations, of some kind. After speaking to the children’s ghosts, you discovered a secret staircase to the family crypts. You fought several monsters, including the children’s parents in the form of ghasts. Following the sound of chanting from further down the basement, you found a dais rising out of murky water. As the party examined the room, 13 dark apparitions appeared on the ledges around the room, chanting, “One must die!” When the party failed to sacrifice anyone, the apparitions called forth a shambling mound. After you dealt with this monster, the Death House – thwarted in its desire – turned against you, forcing you to escape through slashing scythes and poisonous black smoke. Once you escaped, you set the house on fire, hoping to protect any other adventurers from your fate. You left the house to find the dense fog replaced by light rain. Many of the tall, narrow houses in this dark, poorly lit town are boarded up, and you noticed claw marks on many walls. In the distance, you saw an old lady with a rickety wooden cart selling something door to door. In the town square, a single shaft of light illuminated the sign for the Blood on the Vine tavern. Seeking a place to rest, you headed towards the town square, where you heard sobs from a dark, two-storey townhouse, boarded up from the inside. You decided to investigate and found a woman sitting on the floor upstairs, clutching a malformed doll. After you consoled her, she told you that her beloved daughter, Gertruda, broke out of the house a week ago and has not been seen since. Leaving the woman, you went to the tavern, where you found the pudgy little barkeep endlessly cleaning glasses and responding to any questions by mindlessly repeating the menu. You also saw three colourfully dressed and cheerful women at a table near the front door. In the tavern, you met Ismark Kolyanovich. He told you that his father, the village burgomaster, had recently died and that he needed to get his sister to safety, to protect her from the devil Strahd. He also told you that the three women were the Vistani and warned you not to trust them, saying explaining that many Vistani were in league with Strahd. Ismark informed you that the dead man you found along the Old Svalich Road was Dalvan Olensky, a servant of Ismark’s father. The burgomaster had instructed his servant to place the letter at the gates, in the hope that visitors would find it and turn back. Since the tavern does not offer a place to sleep, you agreed to accompany him to the next town, Vallaki, in return for spending the night at their house. Ismark led you to the Burgomaster’s Mansion, a weary-looking building behind a rusting iron fence. The house was marked by signs of attack by large beasts and monstrous humanoids wielding claws and fire. Ismark’s sister, Ireena Kolyana, let you in to a well furnished house that showed signs of great wear, with all the windows barred. Ireena insisted that they bury their father before leaving the village. You spent an unquiet night in the house, with the body of the dead burgomaster in a side drawing room and constant sounds of beasts haranguing the house. In the morning, Castle Ravenloft loomed over the village, like a lance piercing the sky. You decided to go replace your rope at Bildrath’s Mercantile, the other shops in town lying long abandoned. The owner, Bildrath Cantemir, sells common items (including rope) at a greatly inflated price, but his stocks are limited and jealously guarded. Seeking another source of rope and equipment, you tried your luck at the home of a local leatherworker. After your attempts at diplomacy and intimidation failed to elicit any kind of normal response, Asvoh decided to hit someone to “check whether her fists still work” and felled the Svilova girl with a single blow. At this point, you rapidly made your exit. You then helped Ismark and Ireena take their father’s coffin to the church of St Andral, a gray, sagging edifice of stone and wood, its heavy wooden doors covered with claw marks and scarred by fire. Inside you found the village priest, Donavich, mad with grief, praying softly and incessantly while a young man screamed out from somewhere below, “Father! I’m starving!” Upon seeing you, the priest begged you to help him ‘cure’ his son, Doru, whom Strahd had turned into a vampire spawn and whom his father had been locked up in the undercroft. A year ago his son and several other villagers stormed Castle Ravenloft in revolt, having been lured there by a wizard in black robes who came to Barovia from a faraway land. After you descended to the undercroft and slew Doru, the priest was inconsolable. But he fulfilled his promise to help you bury the burgomaster in the cemetery at dawn. During the burial, Donavich offers prayers to the Morninglord in exchange for Kolyan Indirovich’s deliverance from Barovia. Once Kolyan is put in the ground, Donavich suggests that Ireena be taken as far from Castle Ravenloft as possible – either to the Abbey of Saint Markovia in Krezk or, failing that, the fortified town of Vallaki. On route to Vallaki, you crossed an arching stone bridge over a wide river that flows as clear as a blue winter sky through the valley. You noticed the lush life marking the banks of the river as well as an old wooden gallows against the hill. Once you reached the other side, a body appeared from the gallows, with what looked for an instant like a spitting image of Asvoh. Soon afterwards, you were attacked by twisted plant beings of various sizes, but you made quick work of them. You made your way towards the village along a dirt road that clings to the side of the mountain, across an arching, mold-encrusted stone bridge decorated with gargoyles that spans a natural chasm above a waterfall. You followed the Svalich Road as it meanders into the valley until the woods recede, revealing a sullen mountain burg surrounded by a wooden palisade: Vallaki. The dirt road ended at a set of sturdy iron gates, with two guards wielding pikes standing behind them. The vertical logs of the 15-foot-high wall that encloses the town are held together with thick ropes and mortar, and the top of each log is sharpened to a point. Once you convinced the guards to let you in, you made your way towards the local inn. But before you even got there, you were accosted by a local resident, grinning fiercely, who begged you to kill them, if only (you assume) to save them from more festivals. At Ismark’s request, you made directly for the Inn where you believed he and Ireena would be safe from Strahd’s attention. Making your way to the inn, you wandered through the town square and caught sight of the baron’s right-hand man, Izek Strazni, putting up signs advertising the Festival of the Blazing Sun. You also saw seven people in stocks, wearing plaster donkey heads, for what you would later find out to be “malicious unhappiness”. With your guests safely ensconced in their new lodgings, you set out to explore the town. Intrigued by the notion that happiness could be a way to resist Strahd’s influence, you decided to seek out the Burgomaster, AKA “The Baron”, famous for his mantra “All will be well!” and his obsession with festivals. At the mansion, you saw men and carrying bundles of twigs into the house. A maid led you into the house, past piles of twigs in the foyer, to the den where you waited for the baron. The Baron, accompanied by his two huge mastiffs, came to share his conviction that if he can make everyone in Vallaki happy, the town will slip free of Strahd’s dark grasp.The party managed to make temporary allies with the Baron, who insisted that they join him as special guests at the next festival and asked them to back up his insistence that all will, indeed, be well. The Baron also mentioned that two members of his household staff have vanished in the past week: the butler and the baroness’s lady-in-waiting. Since then, another two staff members have disappeared. Making your way through the rest of the town, you met Blinsky the toymaker, who agrees with the burgomaster that the only way to escape from Barovia is to make everyone “hyappy.” Blinsky would like to do his part by making sure that all the children in Barovia have fun toys. Although he appears slightly deranged himself, his shop has proven to be a haven of liveliness in an otherwise dreary land. What did catch the party’s eye was a doll that looked exactly like Ireena. When you asked Blinsky about this, he told you that he makes these dolls at the request of Izek. He also explained that Izek was a terrifying man with a bad influence, and to beware of him. Since your party includes a cleric, Father Lucian told you that the bones of the saint that consecrated the church had been stolen and that he needed someone to find and return them. At the priest’s suggestion, you spoke to Yeska, who admitted that he had told the gravedigger, Milivoj, about the bones. You then confronted Milivoj, who admitted that he in turn had stolen them for Henrik van der Voort, the local coffin maker, in exchange for money to feed his younger sisters and brothers. Following these leads, you found the coffin maker’s shop locked up tightly. You had to break in to confront the proprietor, who admitted that a nobleman named Vasili von Holtz visited him several months ago. He told you that there were ‘things’ living upstairs in his shop and that Von Holtz ordered him to steal the bones. The party discovered a nest of vampire spawn in the coffin maker’s shop, and returned the bones of St Andral to the church. With the bones returned to their resting place, St. Andral’s church is hallowed ground once more. You received a letter from Lady Wachter, inviting you to dinner to discuss what was happening in town. She believed the baron to be delusional and dangerously mad. And though she declared her own allegiance to Strahd – choosing a villain over a madman – you decided to hear her out, considering the burgomaster’s treatment of his people. She told you she needs allies to help her oust the burgomaster. Lady Wachter suggested that they start by killing the baron’s evil henchman, Izek Strazni, and that she would be happy to take care of the rest. Three days after you first arrived in Vallaki, the town ‘celebrated’ the Festival of the Blazing Sun. The dismal procession featured a parade of unhappy townsfolk carrying a large wicker ball to the town square, where it was hoisted onto a wooden scaffold. At this point, before they could set the wicker ‘sun’ ablaze, the sky tore open in a sudden downpour and drenched it. The ridiculous situation proved too much for one of the town militia (Lars Kjurls), who let out an enormous guffaw. The other guards and townsfolk were aghast at this ill-timed outburst and the burgomaster was livid. The paladin, on behalf of the party, intervened and convinced the burgomaster not to banish them from Vallaki. However, the party did not succeed in dissuading him from arresting the guard and dragging him away to his mansion. Having seen the baron’s unhinged behaviour, and hoping to find out what happened to the shoemaker and the guard, you decided to break into the burgomaster’s mansion. This turned out badly, however, due to an unfortunate incident with an attempted rope ladder. The villain Izek, recognising what was happening, attempted to stop you and confronted you at the entrance to the house. He called for the guards and engaged you in melee, but he was killed quickly. Although you successfully avoided arrest, you knew that you would be in trouble if you stayed in town too long. You returned to the Inn, where Urwin Martikov suggested that you leave town for a bit to give him time to smooth things over. He also suggested that going to fetch more wine would help to make people like you. The inn’s wine supply is almost depleted, and the latest delivery from the Wizard of Wines winery is overdue. Urwin asked you to go collect it, and, if possible, to find out what’s holding up the latest shipment. Urwin failed to mention that the winemaker was his father, Davian Martikov. He also failed to mention the bad blood between them.